Home Grown Archives - Page 3 of 5 - Pebbles, Inc.
Hello everyone, Eva Pizarro here bringing you a quick tutorial for a home decor project. Ever since we got married, my husband and I have always loved Friday evenings. For us it’s the perfect time of the week and the beginning of two long days of fun and relaxation. 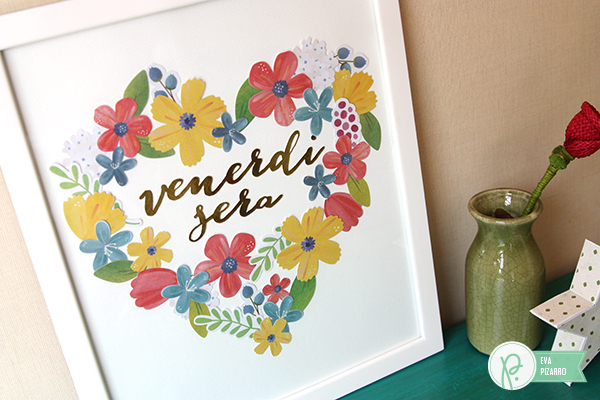 This quick home decor piece reminds us of that special moment of the week. 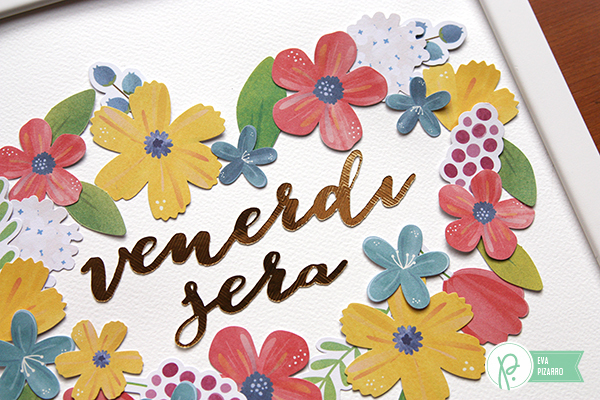 To make it, I cut the phrase “Venerdí sera” – that means “Friday evening” in Italian – using my die cut machine and the special gold paper from the Cottage Living collection. Then I sketched a heart with a pencil. 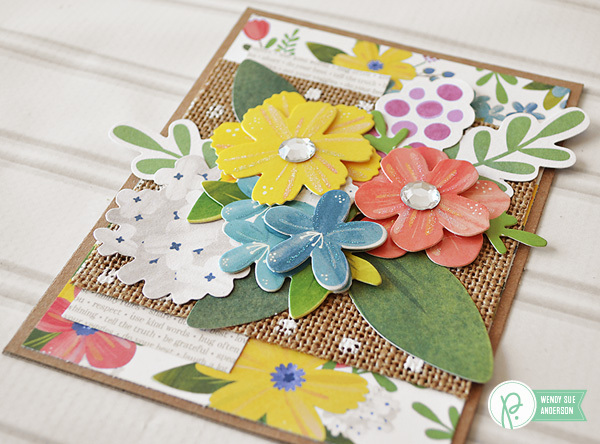 I covered my heart with the chipboard flowers from the Home Grown collection. Start with the larger ones first and then layer the small ones and the leaves. When you have decided on an arrangement, use some liquid glue to hold everything in place. Erase any traces of pencil and enjoy your decoration! I loved how it turn out! 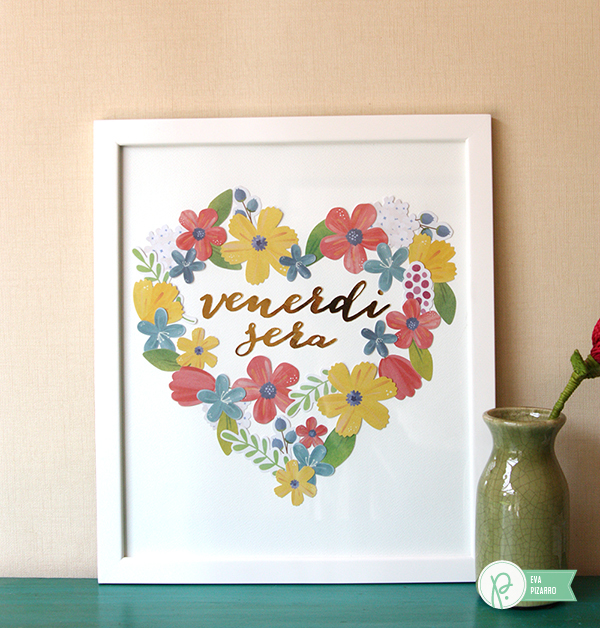 Simple and quick, and it is perfect for my family room! Happy April! 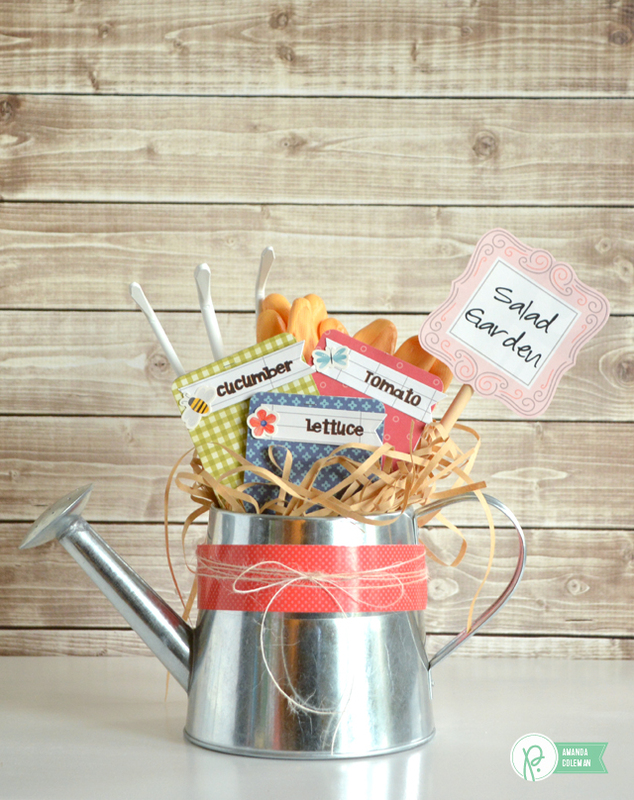 Amanda here today with a quick and easy gift for the green thumbs in your life. Hopefully most of you have dug your way out of the snow by now and are ready to get your garden going. 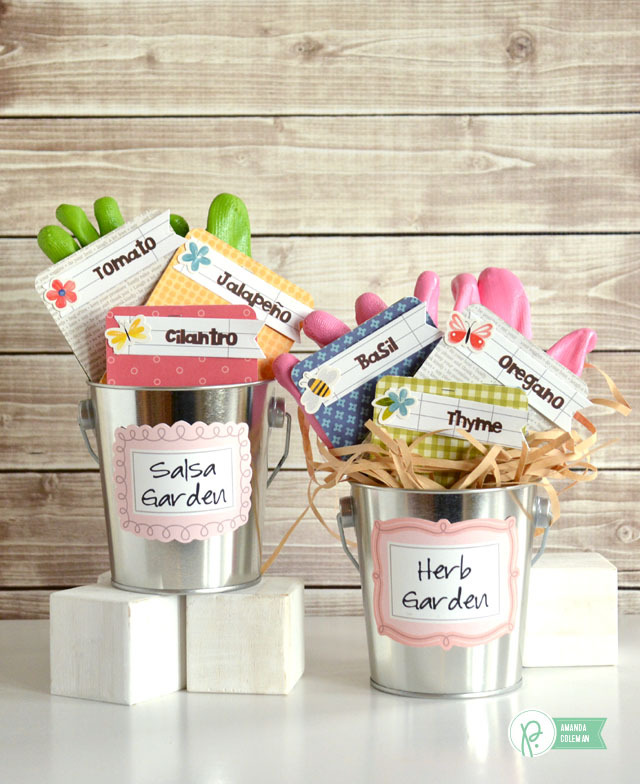 Share the garden love with your friends and family by giving a garden-themed gift container. Garden gift containers are inexpensive and come together in a snap. 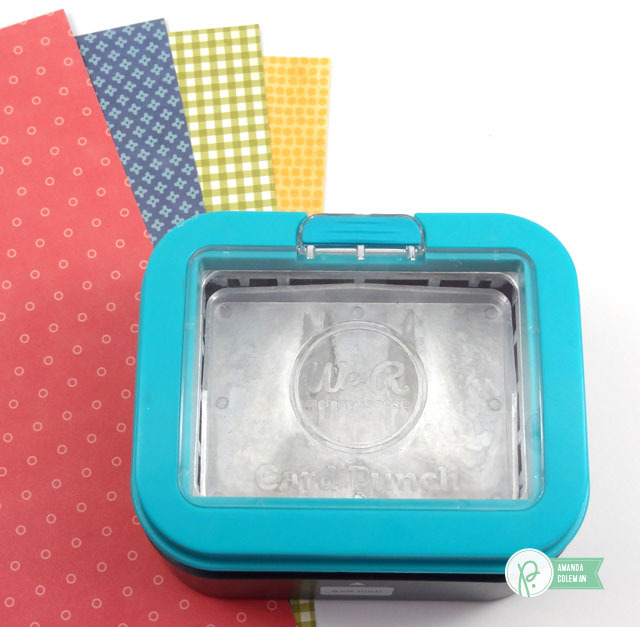 Start with a cute container, your favorite Pebbles patterned paper, and some seeds. 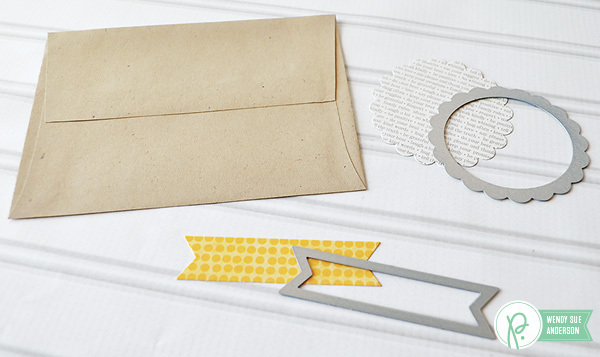 For added gift giving flair, add a hand tool (or two) and a pair of garden gloves. 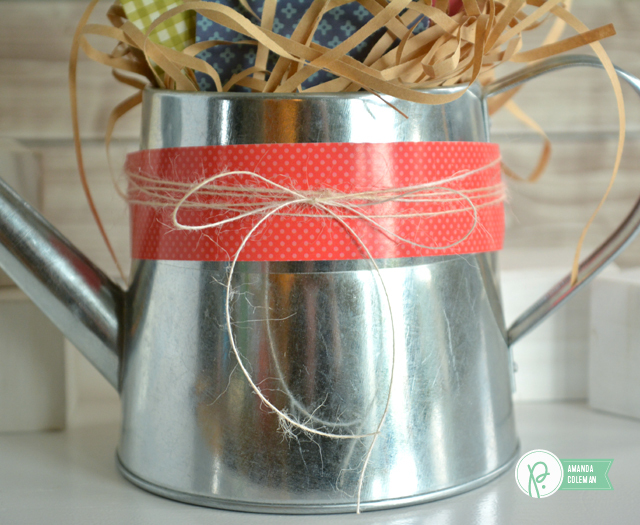 This little watering can is super adorable, but an upcycled tin can would be just as lovely (and earth friendly). Creating a theme for the garden gift containers makes it extra fun. 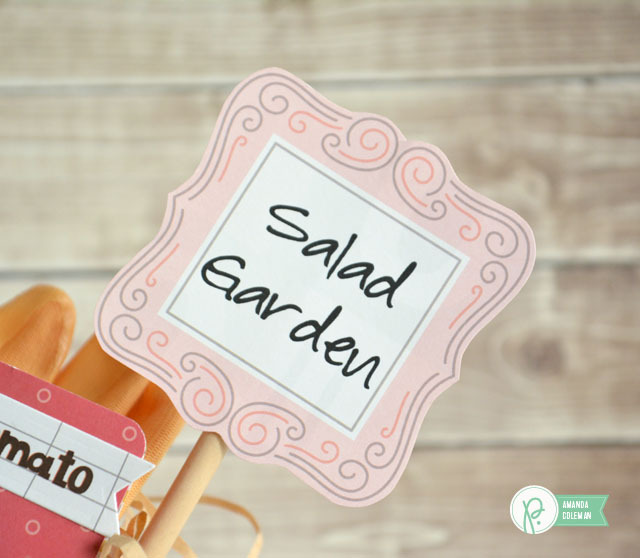 Gather seeds that make a fun collection such as salad, salsa, or an herb garden. 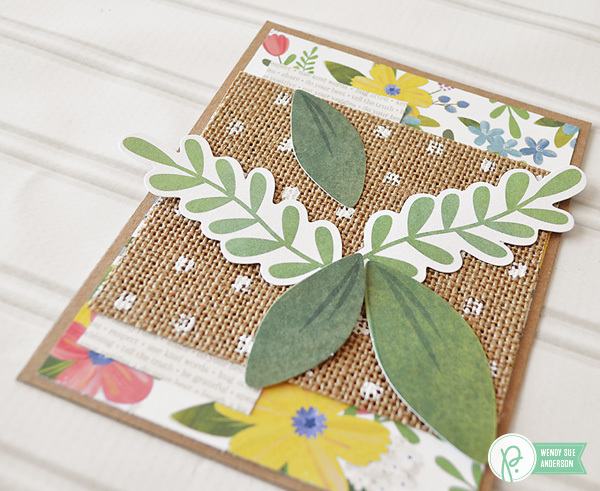 Embellish the seed packets with a cute label and pretty garden-themed sticker. 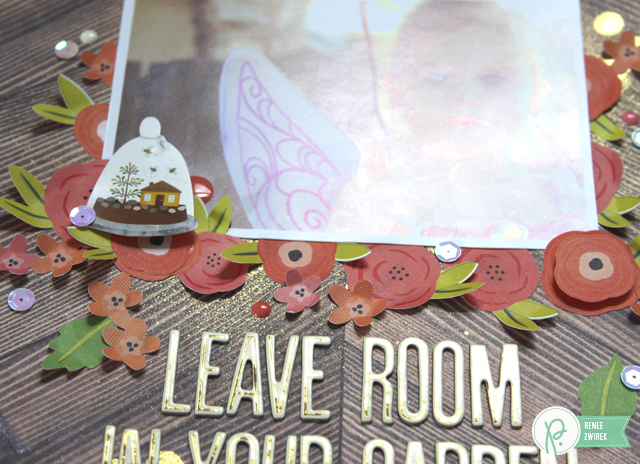 Make a cute garden label by fussy cutting one of the frames from the Gallery Wall paper from the Cottage Living collection. If your handwriting stinks like mine does, choose your favorite font and print directly on the labels. I wrapped the container with paper ribbon from the Happy Day collection and tied a pretty bow with jute baker’s twine. 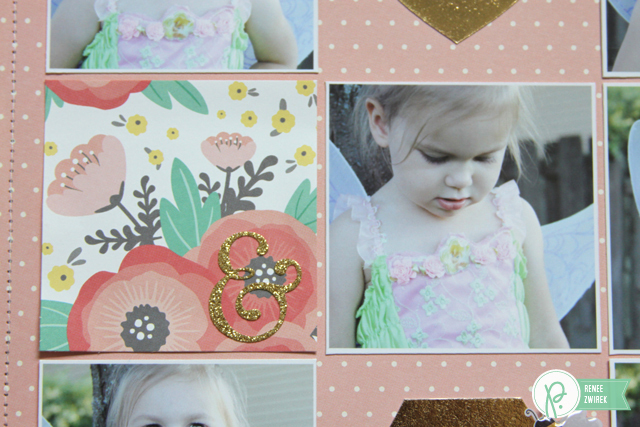 The 3×4″ Picture Punch from We R Memory Keepers is perfect for creating seed packets. 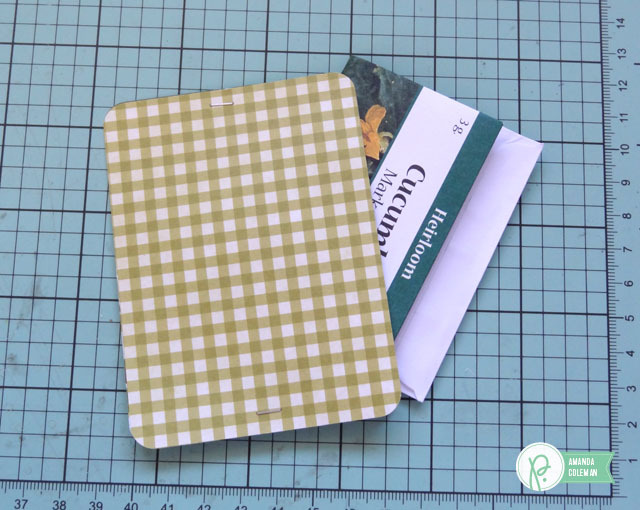 No measuring and no cutting makes creating seed packets super easy. 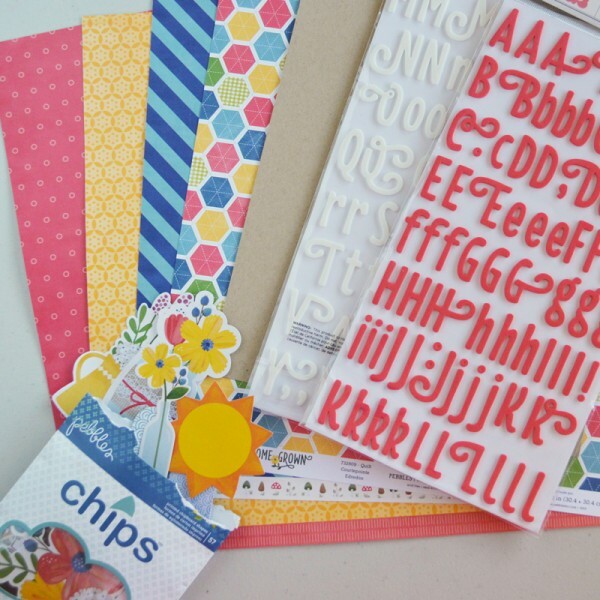 Choose your favorite patterned papers and punch away! Each seed packet requires only two 3×4″ cards. 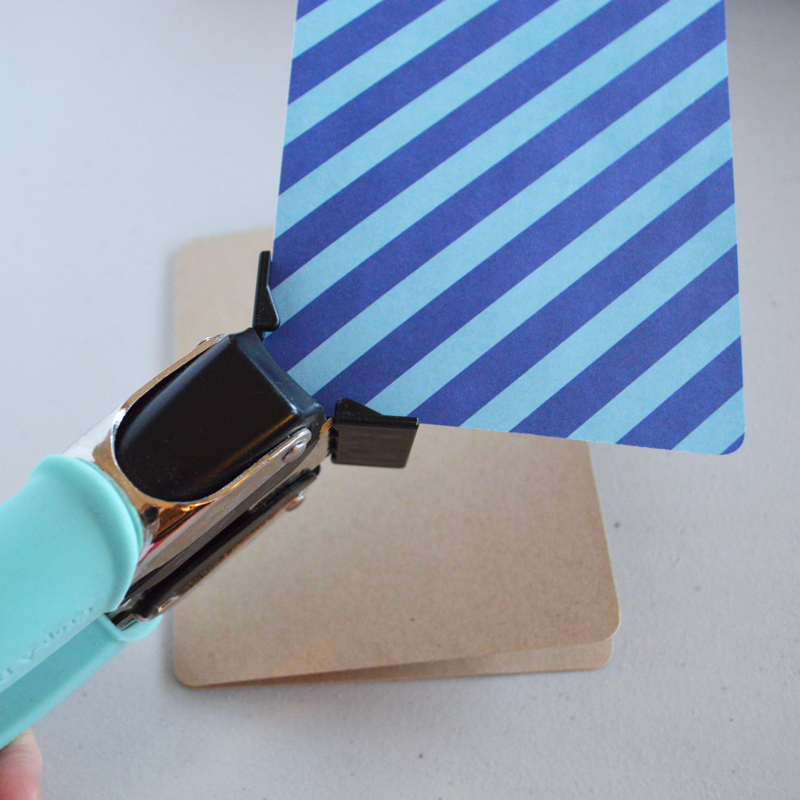 Create the seed packets by stapling two 3×4″ cards together at the top and bottom. Next, fold the seed packet in half and tuck in between the paper. No fuss whatsoever. Choose a cute font and print labels on patterned paper. Die cut the labels using this cute banner die from the Cottage Living collection. 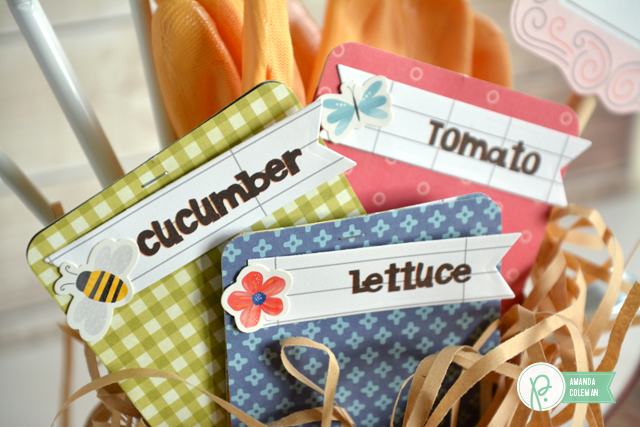 Adhere the labels to the seed packets and add a cute sticker. In an even bigger crunch for time, or have a lot of gifts to make? Simply put a few seed packets into a small bucket (shredded paper optional) and add a label. Quick, easy, and sure to bring a smile! Happy planting! 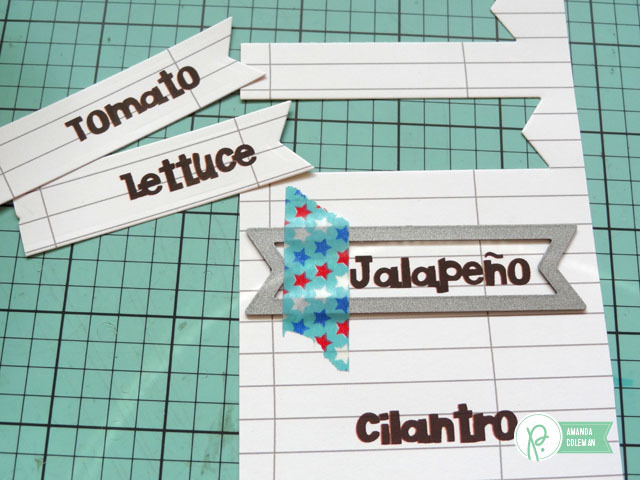 Hello, Renee here today to share a couple of garden scrapbooking layouts with one of them having a short step-by-step tutorial. 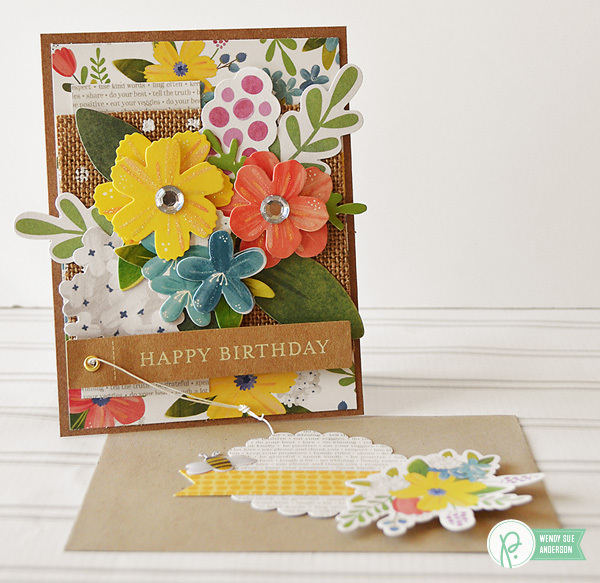 The layouts are not about gardening itself, but they are garden inspired. I used a combination of items from the Jen Hadfield’s Cottage Living and Home+Made, Happy Day, and Home Grown collections. I love how this layout turned out! I used this adorable photo I took of Payton in her Tinkerbell costume from when she was three years old. I took the quote from the inspired image and put it directly onto the page. 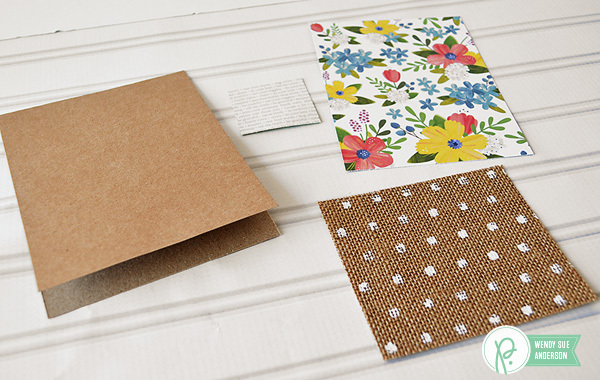 I started by placing the Cottage Living Hardwood pattern paper in a box. 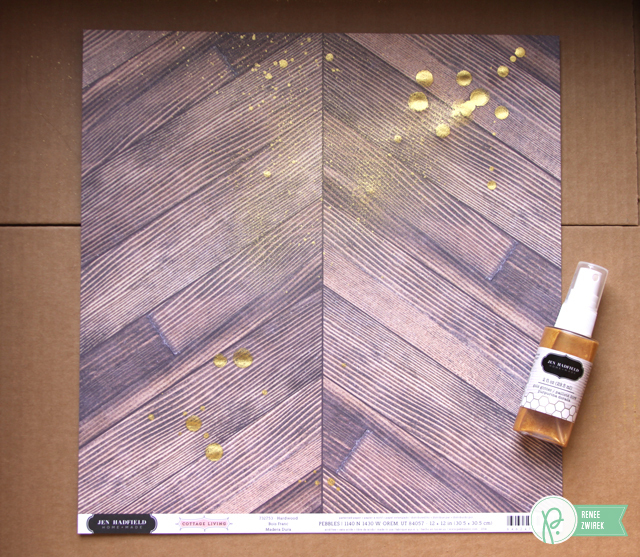 I sprayed and splattered the Cottage Living Gold Glitter Color Mist around the page and focused it more around the spot where my photo would be. My photo measures almost 4 ½” x 6 ½”. I used the center line on the Cottage Living Hardwood pattern paper to center my photo and placed it a ½ inch from the top of the paper. I lined up the Cottage Living Imprint Thickers onto my page by first arranging them on a ruler and then centering them again on the paper. The design of this pattern paper really did help me to center my photo and quote. The last line of the quote is a ½ inch from the bottom of the paper. 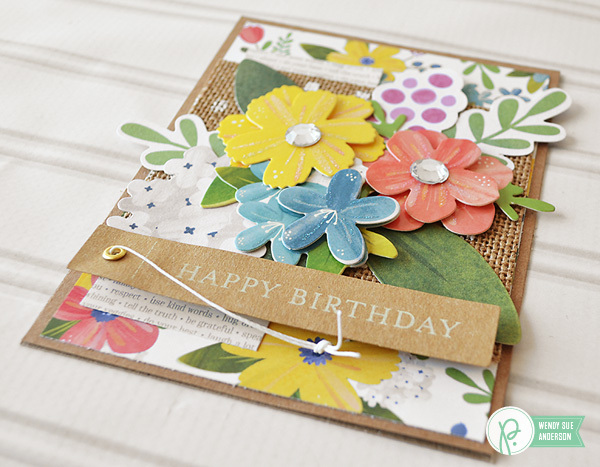 I fussy cut flowers from the Happy Day Garden Walk pattern paper. The colors just worked so well with this photo. 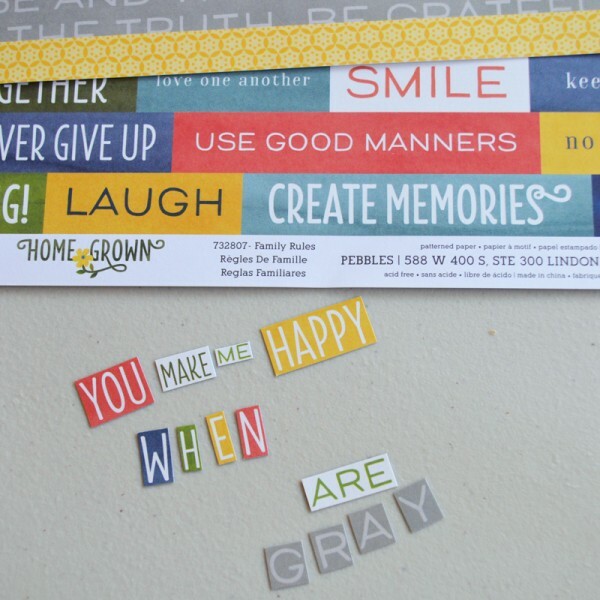 I sprinkled some Happy Day Epoxy Stickers around the page. 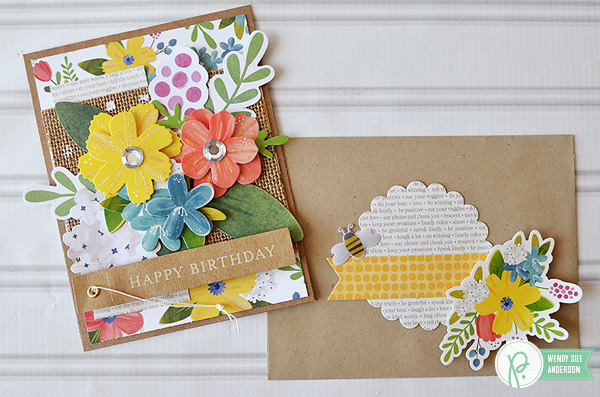 I love the colors of these enamel dots! 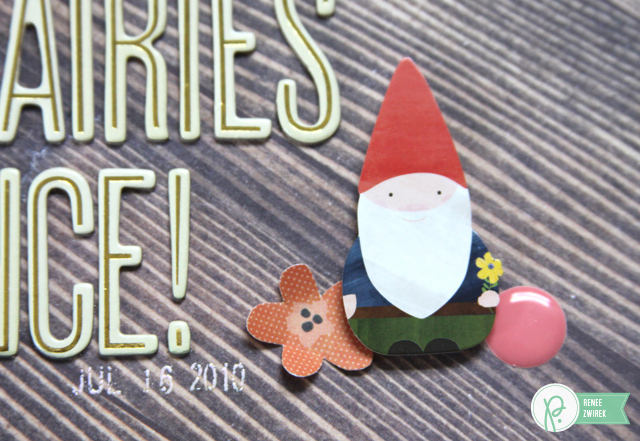 How cute is this garden gnome sticker?! I love this quote. 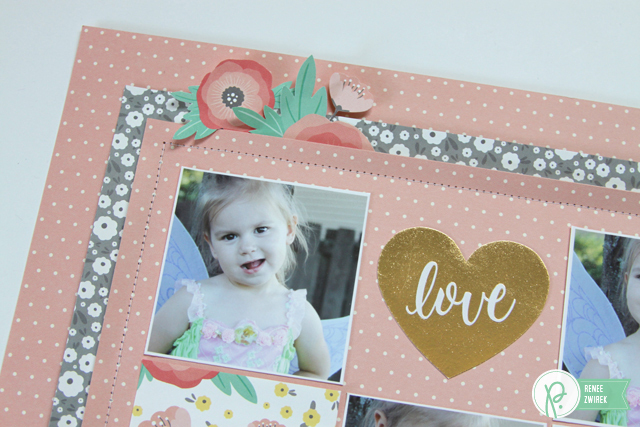 I love these Imprint Thickers! 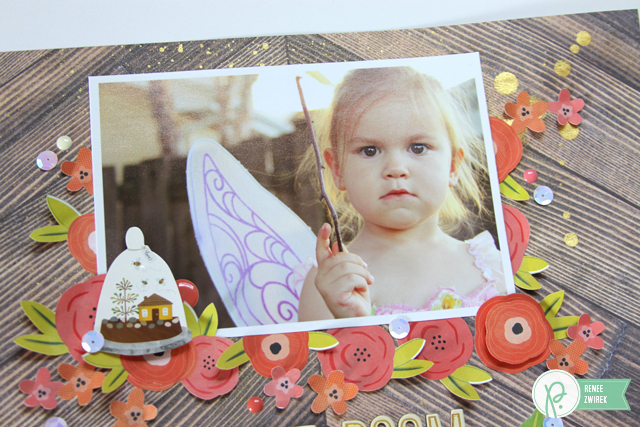 I love the sparkle and shine on this page from the Gold Glitter Color Mist and the Thickers! I love this sweet little garden scene under the glass dome sticker. It’s so cute! Since I had more photos of Payton in her Tinkerbell costume and couldn’t decide on which photo I loved more. So, I just made another layout! Ha! I really love how this one turned out, too. 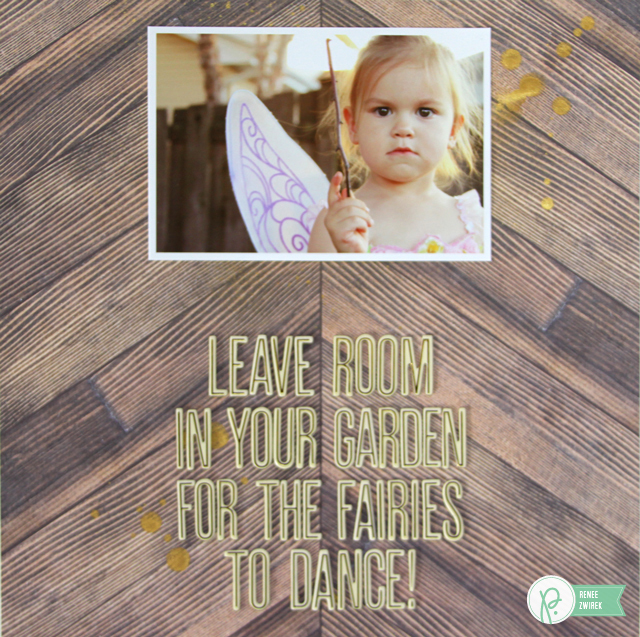 A pretty little fairy playing outside in the garden. I took six photos and placed them in a grid. Each photo measures about 2.75″ x 2.75″. 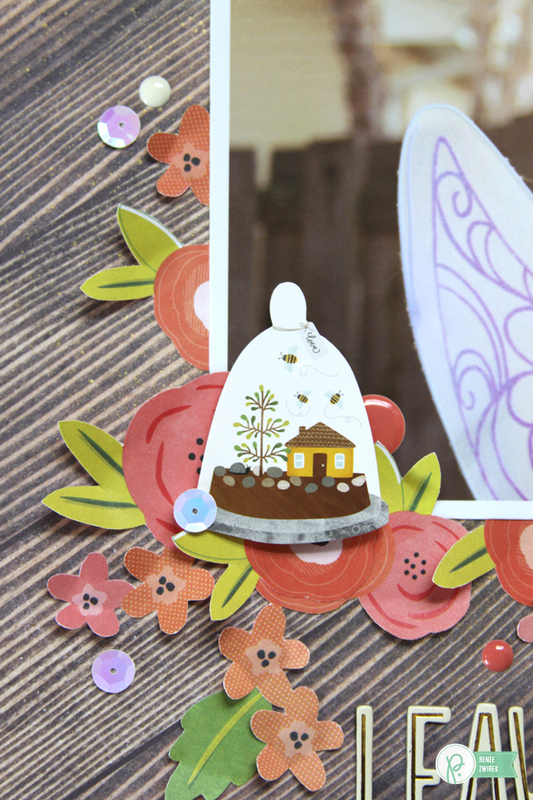 I layered the Cottage Living Spring Meadow and Cottage Living Delightful Dots pattern papers. 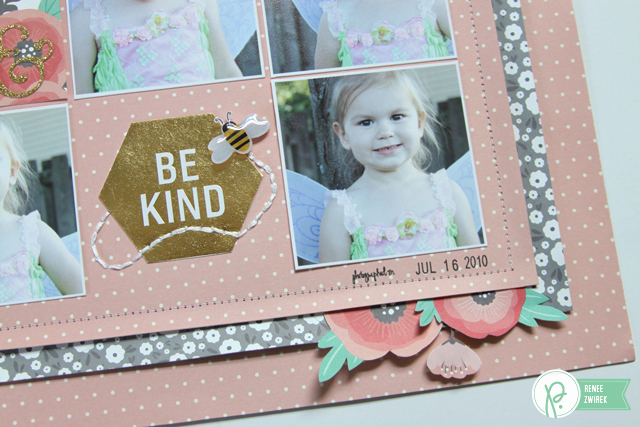 I added the “love” heart and “be kind” hexagon to the grid cut from the Sweet Greetings journaling cards pattern paper. 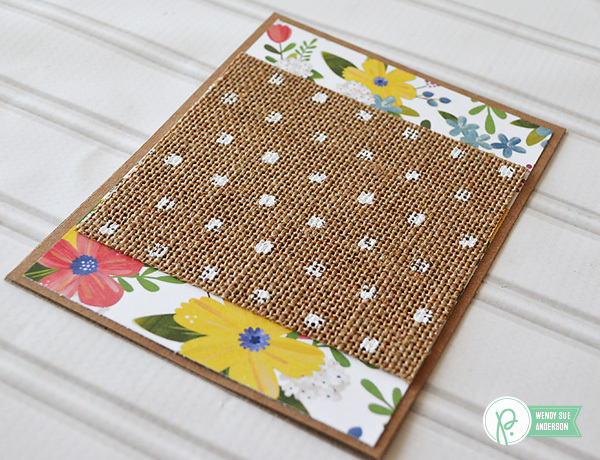 I added machine stitching around my photo grid and a few fussy cut flowers from the Cottage Living Floral Tapestry pattern paper. I hand stitched the buzzing from this cute little bee sticker. 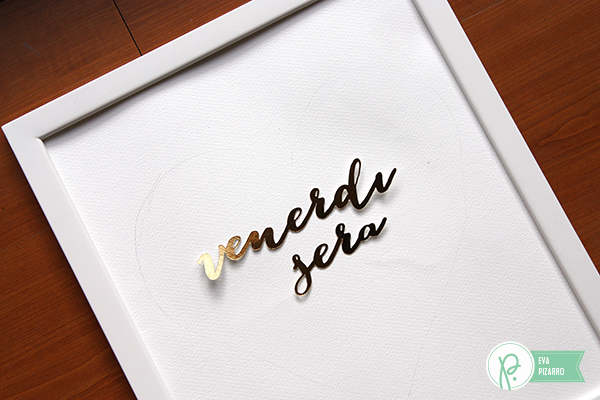 I love the gold glitter and font style of this ampersand sticker. Hi Pebbles friends! 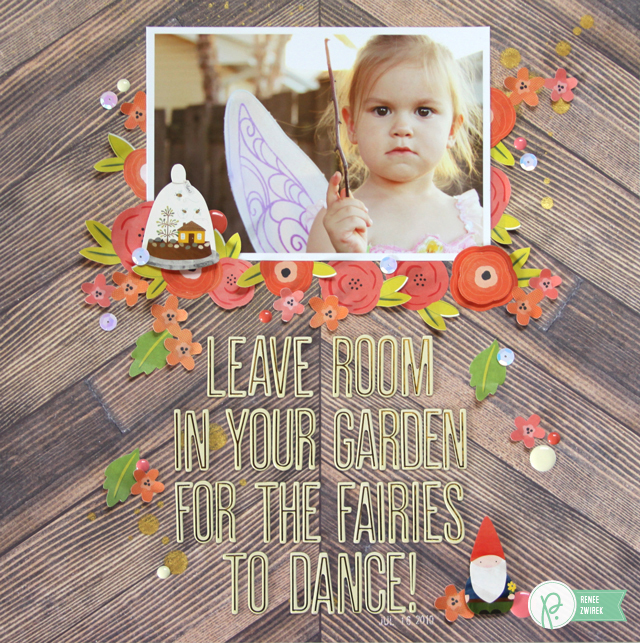 It’s Wendy Sue here today – and it’s my turn to share a little project I created with a “garden” theme. You see, I love (love, love, love) a beautiful bouquet of flowers. The smell of freshly cut flowers makes my heart smile. I love walking in to a room with a beautiful vase full of brightly colored blossoms. The only sad thing about it is when the flowers begin to droop and eventually die. 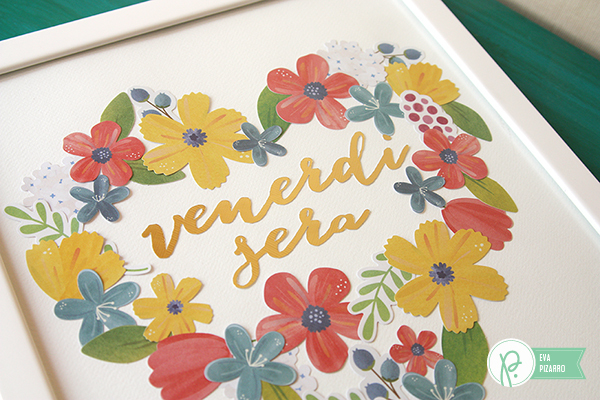 Now, I’m not going to stop adding fresh flowers to my home every now and again…but I sure do love how I can create projects with beautiful paper products and enjoy the flowers forever! 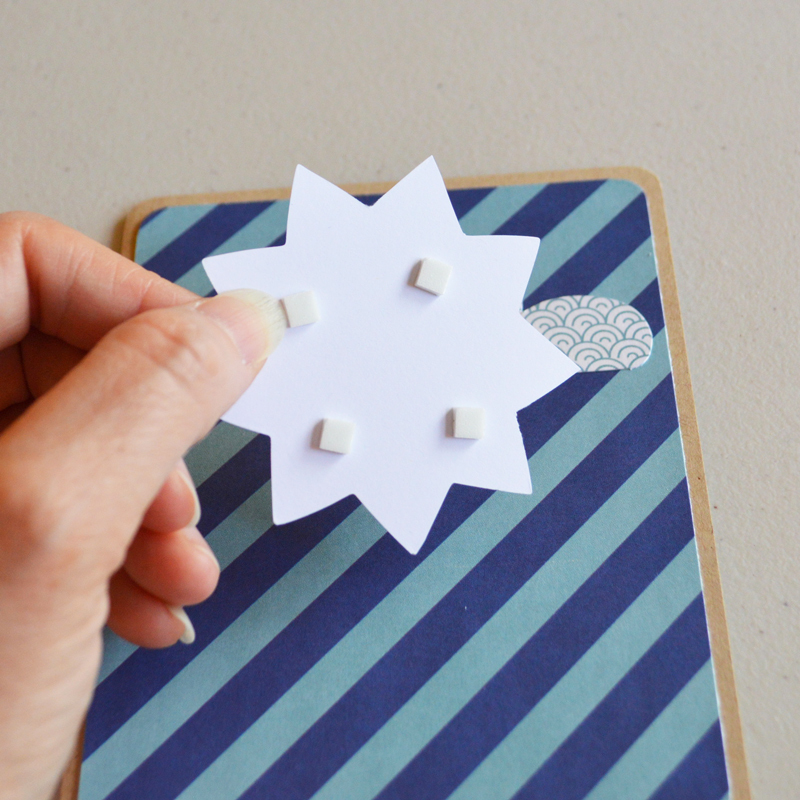 Here’s how you can build a paper bouquet to adorn your next greeting card! First you’ll need to gather some supplies! 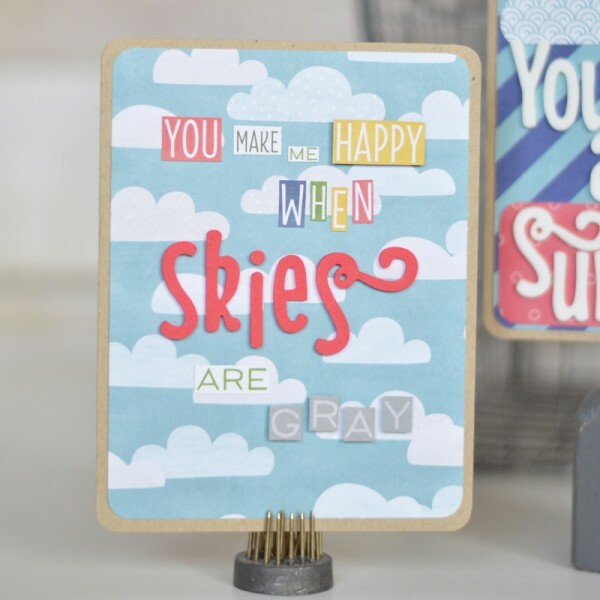 Cut the card base (4 1/4″ x 5 1/2″) from kraft cardstock. 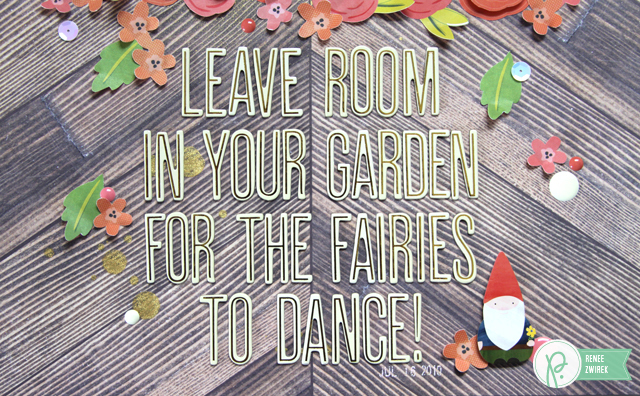 You’ll also need to cut a 4″ x 5 1/4″ block of floral print paper (from the “home grown” collection), a 4″ x 3 1/2″ block of burlap and a small piece (about 2 1/2″ square) of text patterned paper. 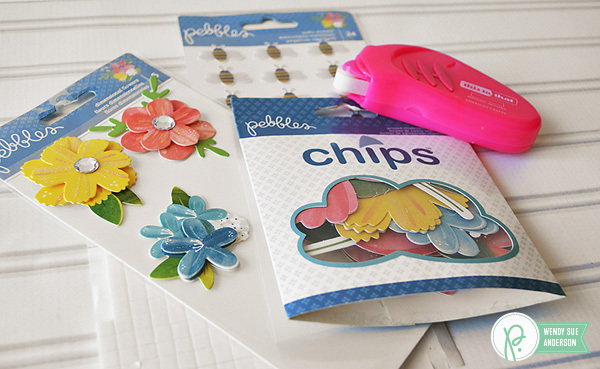 You’ll also want some chips, puffy stickers, dimensional flowers, and adhesive. 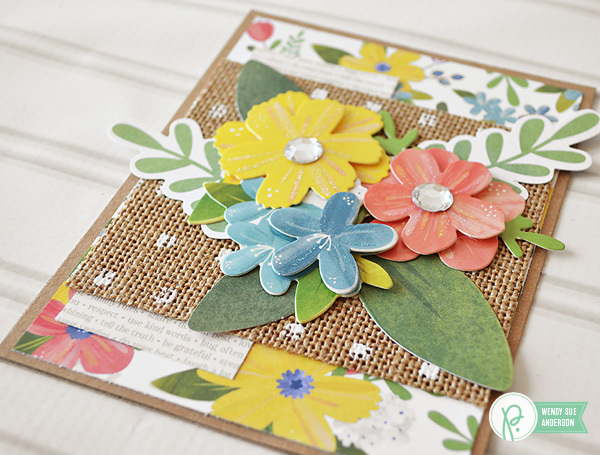 Start building the card base by placing the floral block on the card front. 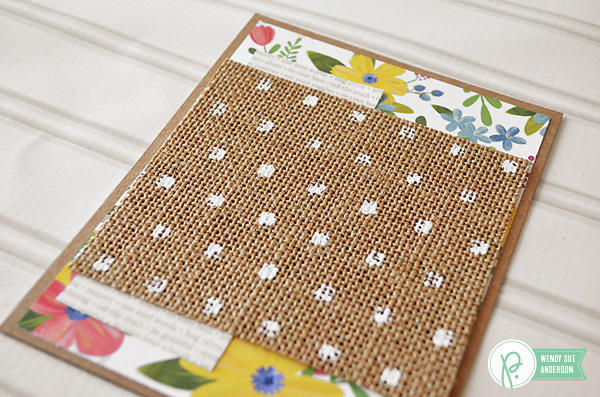 Cut the text block in half and tuck it under the top and bottom of the burlap piece. Start your bouquet by adding some of the greenery. These leaves are from the bag of chips. Now it’s time for the beautiful blooms! Add three of the dimensional flowers on top of the greens. I love these stickers, not only because of the fun dimension, but also because they are embellished with gems and glitter! I wanted some extra color for my bouquet, so I tucked in a few more flowers from the bag of chips! 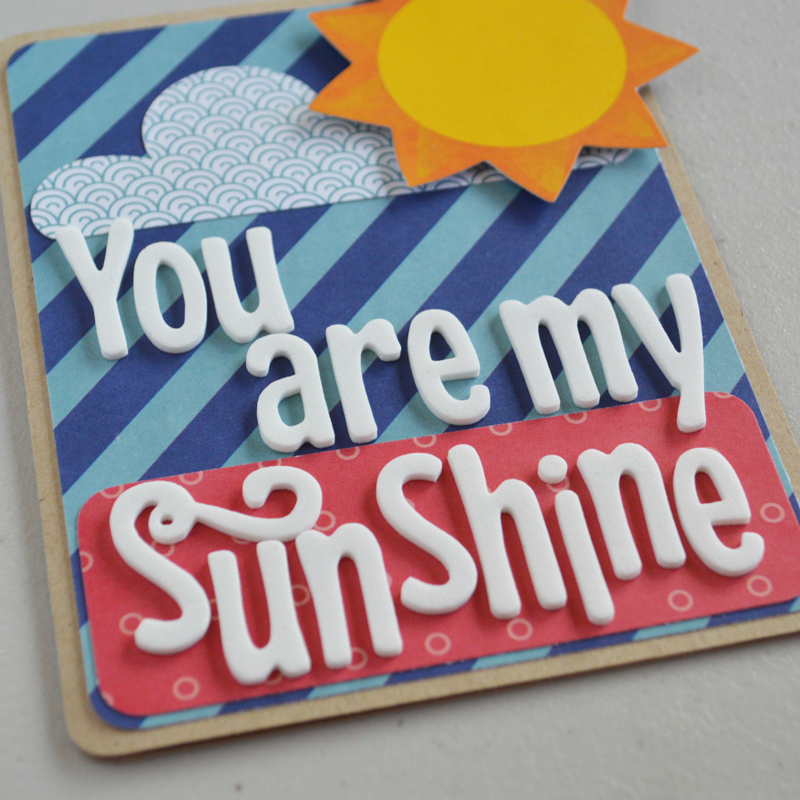 To complete my card, I added a sentiment tag, using foam adhesive squares for dimension. 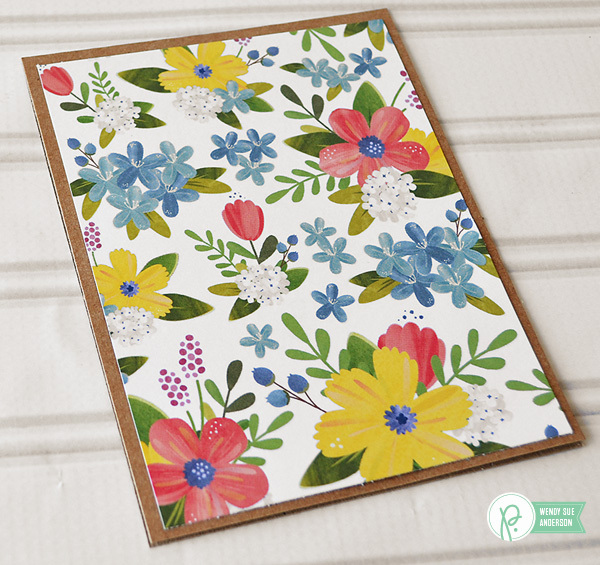 And what’s a handmade card without a beautiful coordinating envelope? 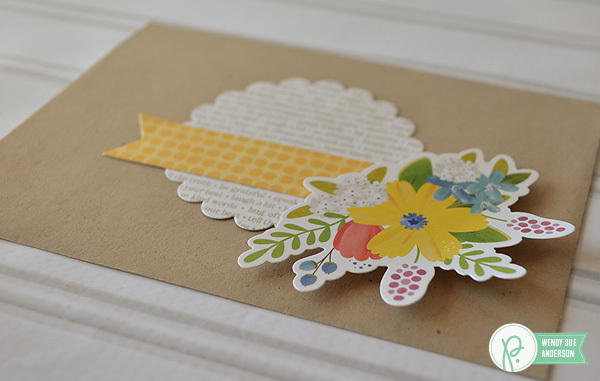 To embellish the coordinating envelope, I used a few of the new dies to cut a scallop circle and a banner from patterned papers. I placed the two die-cut pieces, along with a sticker (adhered with foam adhesive) to the corner of the circle. 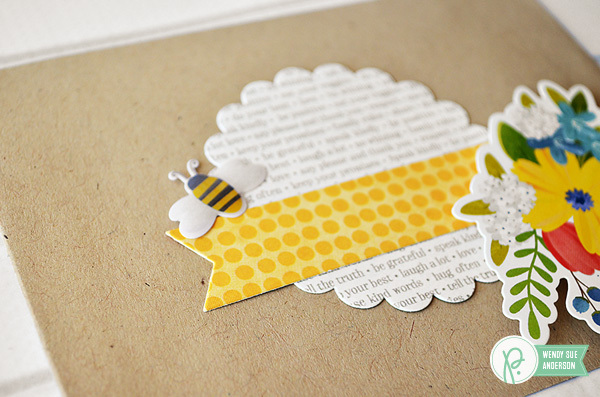 And because we all know that beautiful bouquets attract sweet honey bees, I added a puffy sticker bee to the front as well! And since the dimensional stickers have TWO of each fabulous design, that means we can make a second card and envelope set to coordinate with the first! Hello! I’m Amy, visiting from over at The Happy Scraps. 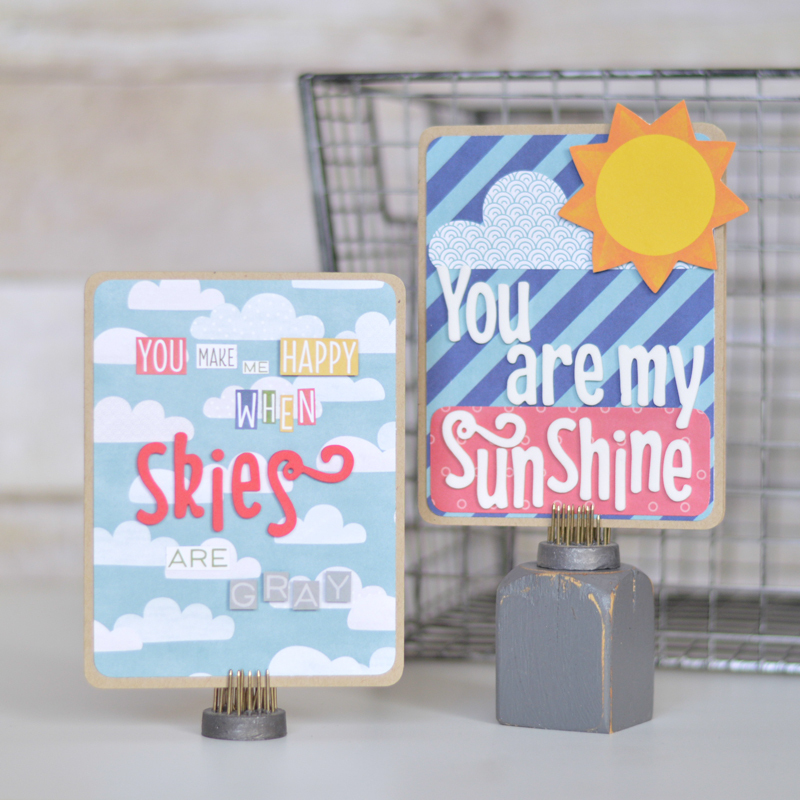 I’m excited to be here today to share a couple of cards with you. It seems like this time of year, there can be a lot of rain. As the saying goes, “April Showers bring May Flowers.” Well, sometimes those rainy April days can be a bit dreary. 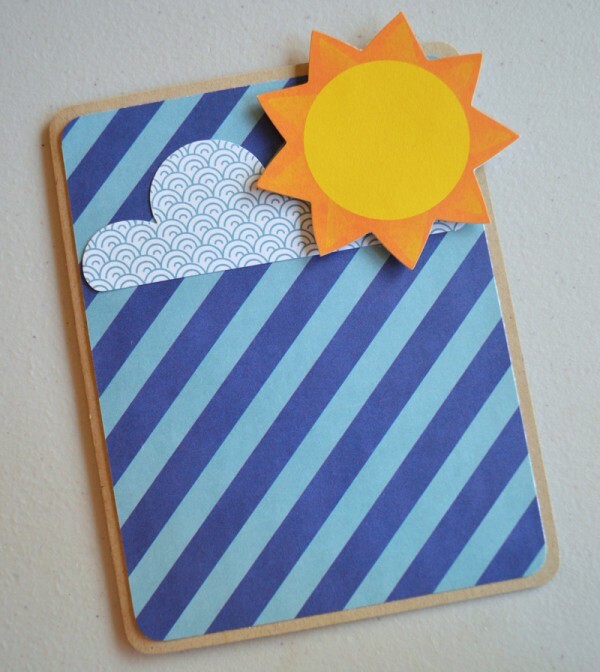 So why not brighten someone’s day by giving them a fun card?! Cards are some of my favorite things to make because they come together so fast. Today I’m sharing two cards with you – a “You are my Sunshine” card and “You Make Me Happy When Skies Are Gray” card. 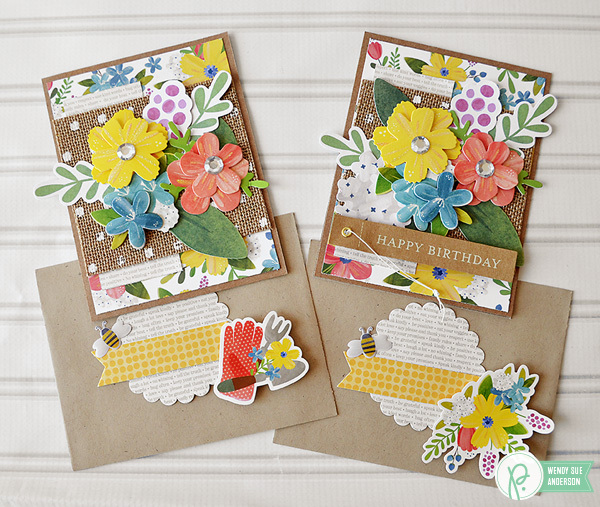 For both of these cards, I used the Home Grown paper line with chip embellishments. I used an 8.5 x 11 piece of Kraft cardstock, cut it in half, then folded the two halves to make two card bases. Next, I cut some patterned paper, just smaller than the card base, 4 x 5.25. I rounded the corners on both the card base and the patterned paper. 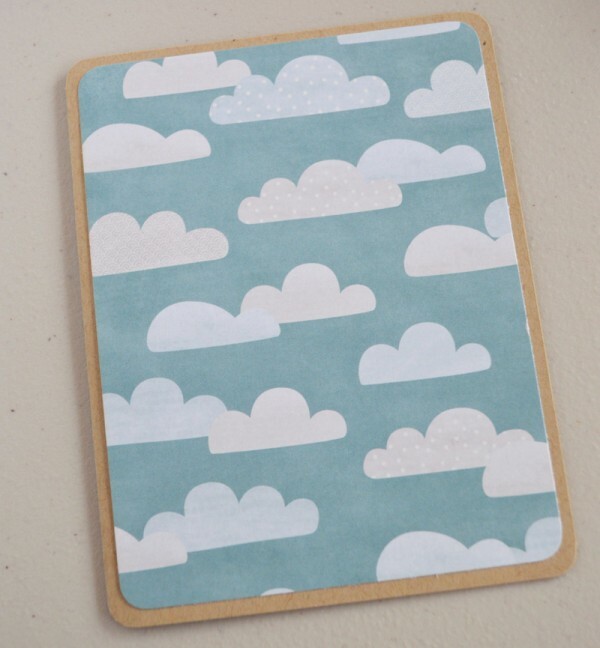 Then I adhered the patterned paper to the card base, and used one of the cloud shaped chips and adhered that to the card as well. Next I used some foam dimension squares and put them on the back of the sun shaped chip. I adhered the sun over the top of the cloud. 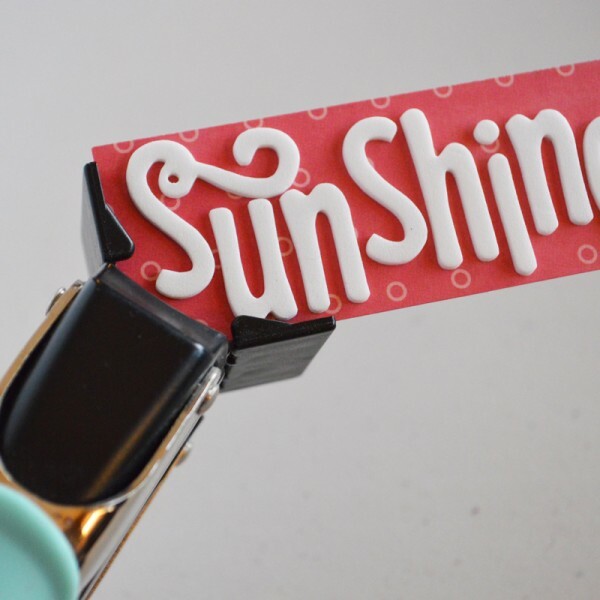 Next, I spelled the word Sunshine, using thickers, onto the red polka dot patterned paper. I trimed the edges leaving a small boarder, and then I rounded the corners on it as well. 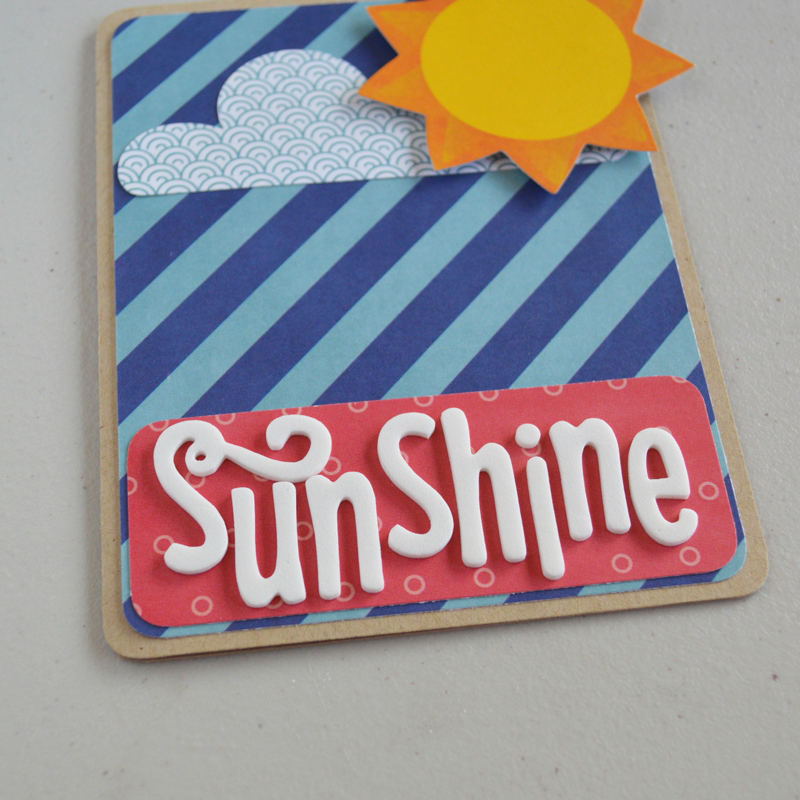 I adhered the Sunshine to the bottom of the card. 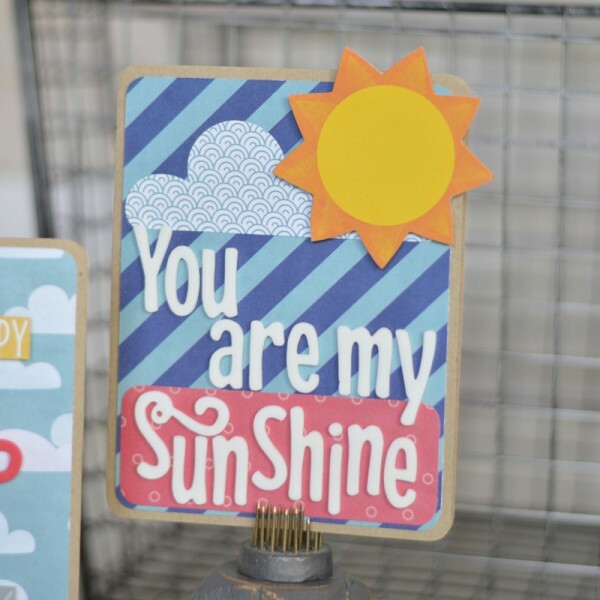 Next, I used thickers to spell out the rest of the saying, “You are my” above the sunshine. And that finishes up this card. For the other card, I had some fun with the paper filled with words. I looked over it and found most of the words that I needed, and then cut out separate letters for the other words. 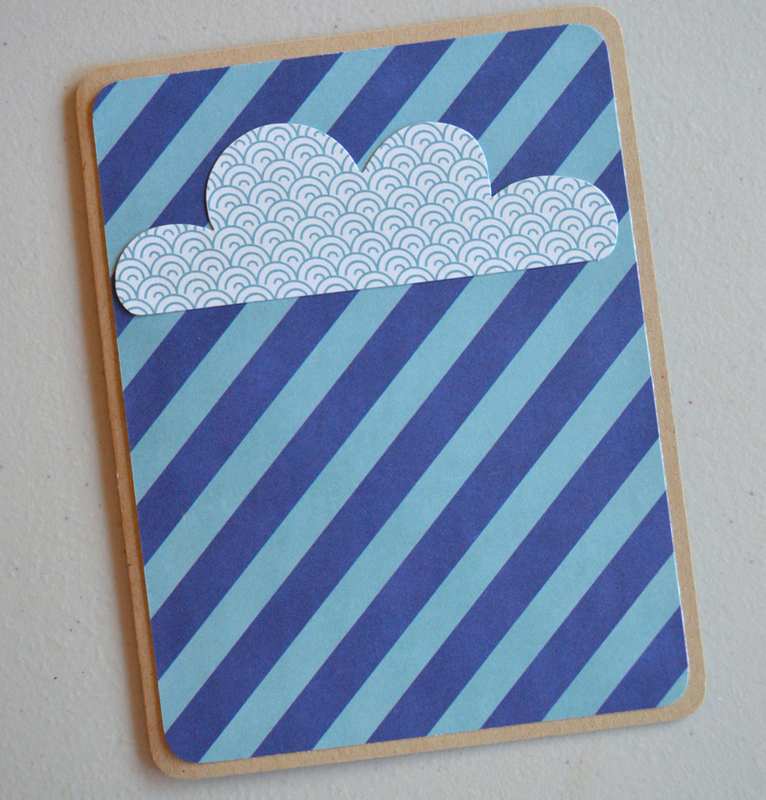 I cut the cloud patterned paper to fit the card base and adhered it to the card. With a mix of foam dimension squares and adhesive, I glued down the words and letters. I used thickers to spell “skies”. So sit down for a few minutes and make some cards, and brighten someone’s day! I’m sure they would love it!